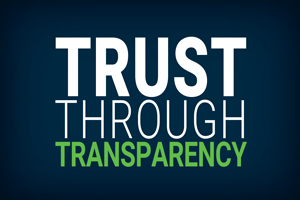 Regardless of the driver behind your transparency initiative, here are some simple steps to improve procurement transparency. Public notification of bid opportunities is a cornerstone of public procurement in most developed countries. Some regions and government offices still publish notices in local newspapers; today, however, the internet is the primary platform for posting bid/RFx solicitation notices and distributing bid documents. Solicitations can be published on websites using basic content management software while e-procurement platforms, such as ProcureWare, make the process much easier. Below is an example of public solicitations from the City of Vancouver, Washington. 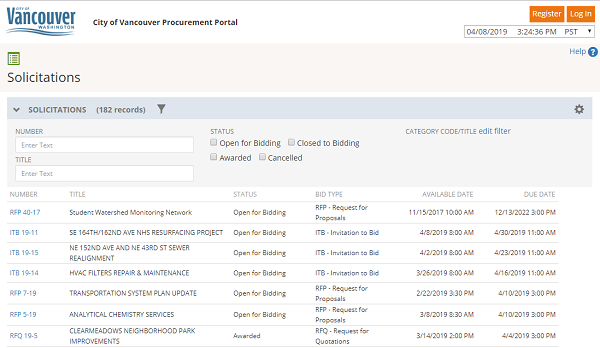 The public and potential vendors can see bid opportunities and get basic details, such as a description of the opportunity, contacts, and due dates. Vancouver also provides a budget estimate and a bidders list. Publishing bid or tender solicitations is a great first step to improve transparency; today, however, vendors expect more. They want to be notified of the opportunities, as well as control the categories relevant to products or services that they provide. To give vendors the control that they expect, you need an online vendor registration that creates a self-managed supplier profile. This practice ensures that information is up to date and shifts responsibility to suppliers. Below is an example from the Chicago RTA. Once suppliers provide you with their company information and the categories of interest, they expect to be notified of potential bid opportunities. An integrated notification system is key and should send an email when a bid opportunity is available and when addenda are posted. Also, it should send reminders about due dates, prebid meetings, or any other milestones in the process. A bidders list is like a construction bid’s planholder list; it includes companies that have expressed interest in a specific bid or tender solicitation. 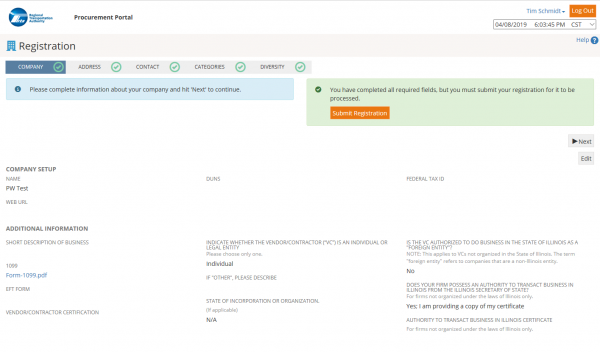 With ProcureWare, the list is automatically generated when a potential supplier takes an action, such as downloading a document or submitting a question. Making this information available to the public provides another level of transparency and emphasizes that the tender is open and fair. Many public agencies are required to publish planholder lists for construction projects. Below is an example from Lincoln Electric System (LES), an electric utility in Lincoln, Nebraska. Most organizations, public and private, allow potential vendors to submit questions regarding bids or tenders. To improve transparency and provide all suppliers with equal opportunity, it is best to share all questions and answers with all potential vendors. While the Q&A session or addenda may be sent out via email, it is best to also post the information on the website to prevent supplier missing the information. Below is an example from the City of McAllen, Texas. Note that the response to one question refers to an addendum while other questions are answered directly on the clarifications page. In addition to posting the Q&A, it is best to also send notices about posted addenda and answers to questions to all potential bidders. Systems like ProcureWare automatically manage the notifications. Most of the information so far is related to an open and transparent process, which gives all potential suppliers equal-opportunity to win the contract. Once the bid or tender submissions have been received and an award had been made, it is equally important to share information that “proves” that the process has been fair. Posting the award and supporting documentation take transparency to a higher level. Below is an example from public schools in Des Moines, Iowa. Beyond simply posting the winning supplier, it also includes pricing details. 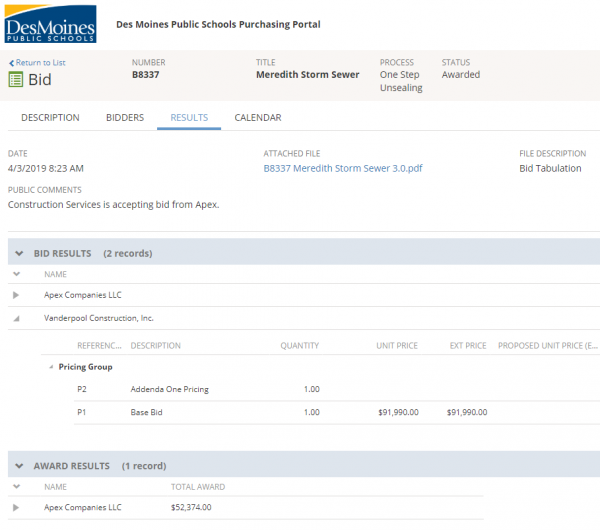 Published award information for bid solicitation at the Des Moines Public Schools. The final step in transparent sourcing brings the entire process full-circle. Publishing the resulting contract shows the result of the sourcing process while also giving suppliers equal opportunity to compete for the contract when it comes up for renewal. Publishing could be simply posting the contract documents or publishing summary information, including the contract holder, contract amount, start and end dates, and renewal details. Below is an example from Valley Metro, located in Phoenix, Arizona. It shows basic information about current contracts. List of public contracts that can be accessed from Valley Metro in Phoenix. Valley Metro shares the contract documents, pricing, and other details. Although there are seven steps, there’s one more thing that you should be doing: documentation. I call it the un-step because it is a process that should encompass all steps. It should be an ongoing activity. End-loaded processes are error-prone, typically incomplete, and less convincing to auditors. You should identify the documents that will be necessary to defend your process and make sure that you archive everything in an easily retrievable way. ProcureWare assists by archiving all RFx documents, bid responses, correspondence, and actions of buyers and vendors. An interactive audit log makes all details easily accessible. Auditors love it! And, as they say, “happy auditor, happy procurement officer.” Not heard that one? Oh well. Regardless of what transparency means to your organization or what your transparency goals might be, keep in mind that transparency can often head off potential problems before there are problems. Applications like ProcureWare can provide you with that transparency, creating confidence, increasing competition, and reducing costs. For examples of organizations that have transformed their procurement process to be more transparent, check out these case studies at http://www.procureware.com/clients/#case-studies-section-one, or contact us for more information.